For developers, it provides a simple COM interface to select and use a converter from the repository. It is easy to use from VBA, C++, C#, Perl, Python or any .NET/COM enabled language. This package is fully integrated with SIL FieldWorks, Speech Analyzer, Phonology Assistant and Adapt It software. It provides the same system-wide registry of installed and available encoding converters for all of these user programs. Additionally the package includes some extra utilities such as a clipboard converter for manipulating text between cut and paste operations. A new transduction engine was added that provides support for the webpage-based converters in the Scientific and Technical Hindi Google Group. The Files section of that group contains a number of webpage-based encoding converters and transliterators for numerous Indic legacy encodings. The conversion code embedded in these web-pages can now be used to convert data with any SIL Converters client application (e.g. the Bulk Word Document Converter) by using the new Technical Hindi Html EncConverter Add-in. 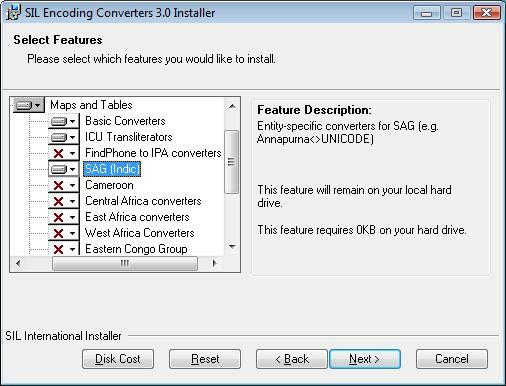 To activate this new add-in be sure to check the Maps and Tables, Indic converters feature during installation. Once installed, you can read Help for Technical Hindi (Google group) Html Converter Plug-in (in Start, All Programs, SIL Converters, Help) for further instructions. 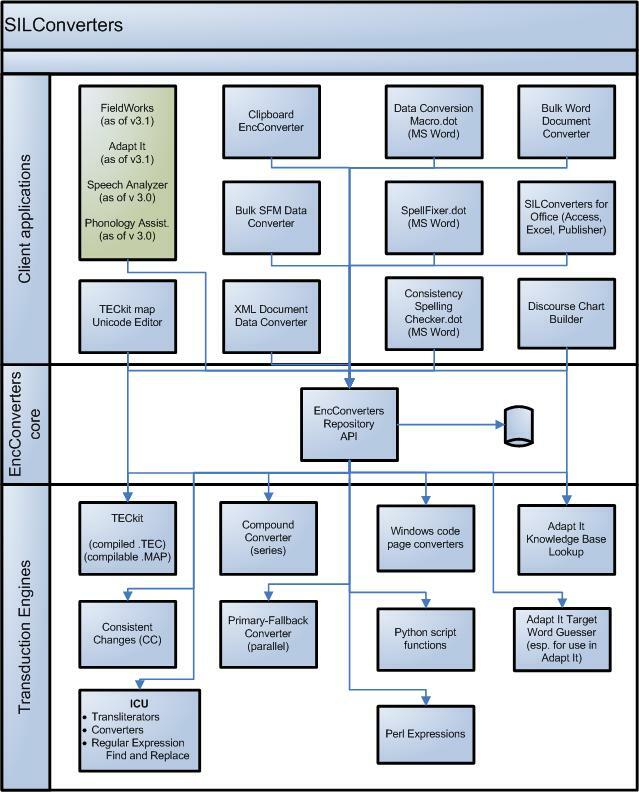 SILConverters 3.1 corresponds to the same version of the core EncConverters assembly as FieldWorks 6.0 and overcomes the uninstallation problem previously encountered in Speech Analyzer 3.0.1 and Phonology Assistant 3.0. If you uninstalled any of the applications which used the earlier version of the EncConverters core, it would become unavailable to the other applications that used the same, earlier version of the EncConverters core until an installation Repair was done. See this webpage for details. This new version solves that uninstallation problem. Full installation instructions can be found here: SIL Converters 3.1 Installation. This document is intended to guide you through the Master Installer installation screens and initial SIL Converters 3.1 Setup. This guide may be sufficient for many users. However, to make full use of SIL Converters, you should download and refer to the Help for SIL Converters documentation (download below). This document gives installation help. This is the same information that is found here: SIL Converters 3.1 Installation. MD5 hash: A659FDFC39DF7704FDDFD33BFFF122DF This contains the same files as the above SIL Converters 3.1 package only (no addons) for offline installation (EXE file). It is provided for those who cannot download an EXE. MD5 hash: 32C26291CCE29DA12C63616D0C4E8733 This contains the same files as the above SIL Converters 3.1 Standalone installer (includes addons like .NET) for offline installation (EXE file). It is provided for those who cannot download an EXE.